Nothing like a package to cheer you up on a Monday! My October Julep Maven box arrived in the mail, just in time for October 1st. They've been playing with box sizes recently. This one is square. I am usually an It Girl but I switched to Bombshell style this month. I was excited to try their quick dry drops and I wanted a black shatter. 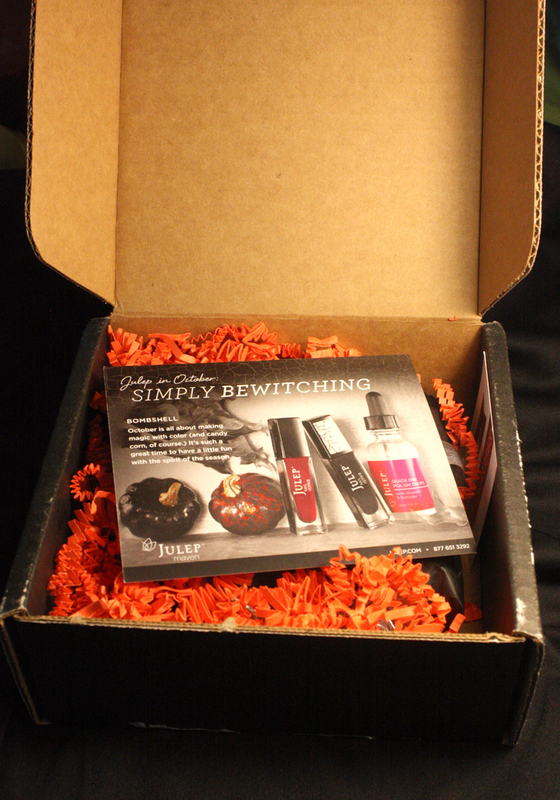 Upon first opening, a bed of festive orange paper cushions the goodies with a Bombshell box summary card on top. Here are all the cards that were included. The top is for Juleps Bombshell box on the back is a short tutorial for how to use the polishes included in the box. There is also a small quote, "Never put your faith in a Prince. When you require a miracle, trust in a Witch." - Catherynne M. Valente. Finally they included ingredients and allergy information for candy corn! I'm very pleased with my extras this month! 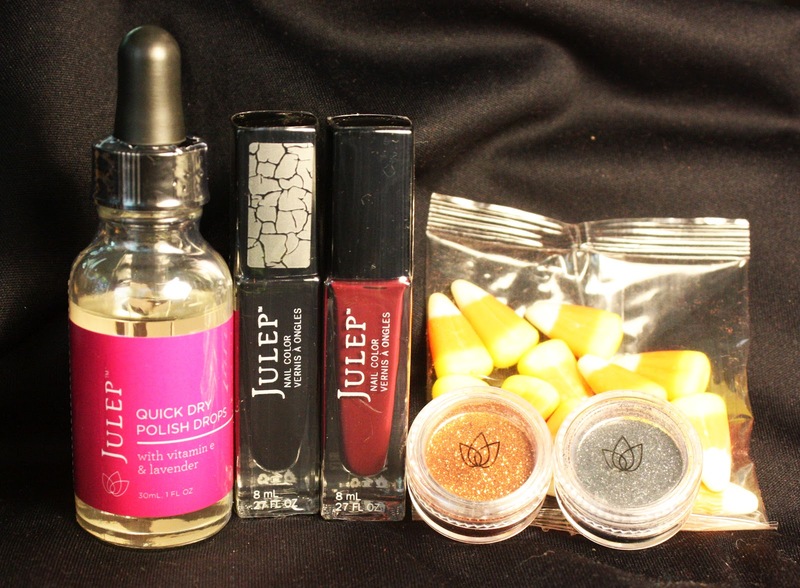 There is a black and orange loose glitter with the Julep logo on the cover as well as some candy corn! The candy corn was delicious. My polishes and quick dry drops were wrapped up in a black baggie and tied with a white ribbon. Now for the good stuff! I received Juleps Quick Dry Polish Drops (I've never tried quick dry drops so I'm very excited to give it a whirl), Julep Ursula and Julep Keira. 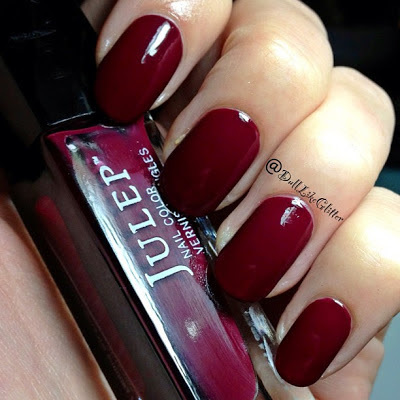 Ursula is your basic black shatter polish and Keira is a dusky, deep, creme maroon. 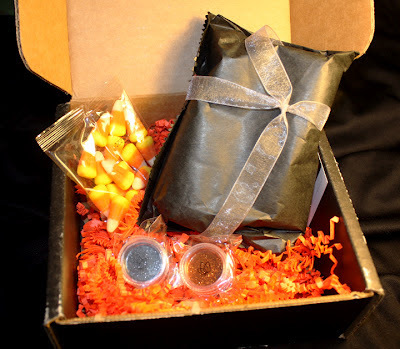 The candy corn was snapped up in a a few minutes and the loose glitter is very versatile. You could use the glitter on your body, dip wet nail polish in the glitter to give a super awesome shine to a mani or accent finger or even make your own Halloween glitter franken polish by pouring it in a top coat. 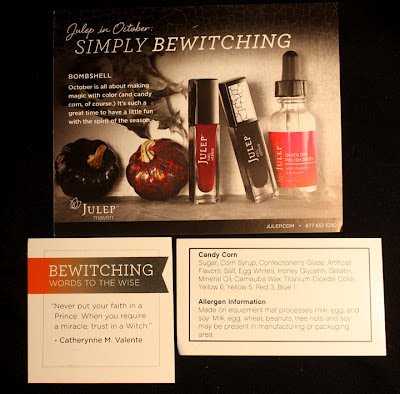 If you would like to try a Julep starter box they are running a deal to get your first box for 1 cent! Just go to this link, take the Julep style quiz to find out what style of Maven you are and add it to your shopping cart. Upon checkout use the code COLOR2012 or PENNY to get $19.99 removed and only pay 1 cent for the whole box! If you like the subscription they will send you a new box of polish and accessories for $20 a month. If you don't like it or just don't feel like having a subscription you can easily cancel at no charge and keep your 1 cent box. I highly suggest this service. I look forward to it every month! Hmmm, perhaps I will finally try this subscription thing!! How do you like the drying drops? I got the choice box that just had the three polishes but now I kinda wish I gotten the drops. I've never used drops before so I can't really compare them to anything but I really liked them! They definitely dried quickly and moisturized my cuticles at the same time and I really enjoyed them! I've been using them more frequently now. I still think I prefer a quick dry top coat but I usually go to them in a pinch. Yep! They only survived till the camera was done clicking. Then it was furiously and deliciously down the gullet.